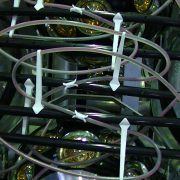 The Launcher of Optical Modules – or LOM for short – is a KM3NeT customized system that works fully mechanically. 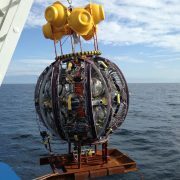 The 700 m long detection unit consists of 18 pressure resistant glass spheres with the photosensors inside supported by two parallel ropes firmly connected to the anchor at the seabed and held vertical with a synthetic buoy at the top. At regular distances synthetic horizontal spacers keep the two ropes parallel. 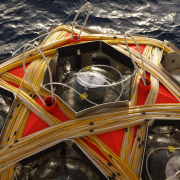 An electro-optical cable runs the full length of the unit from the optical module at the top to the base module at the anchor changing from the one rope to the other at the occasion of a spacer. 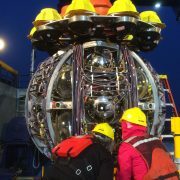 The full system is coiled around a spherical aluminium frame. The ropes and the cable run in the cable trays on the frame. With empty glass spheres integrated, the frame is made buoyant with empty glass spheres integrated in the frame of the launcher. 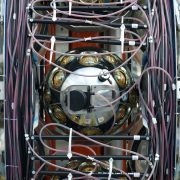 The optical modules are stowed inside the frame. 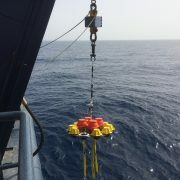 The frame is kept firmly in position at the anchor of the detection unit with thick ropes running through the frame from the top to the anchor. At the top the thick ropes are connected to a crown of empty glass spheres. 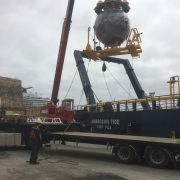 After touch down at the seabed and connection of the detection unit to the seabed infrastructure, the crown is released followed by a release of the launching vehicle that will float to the sea surface while uncoiling the detection unit to its full length. 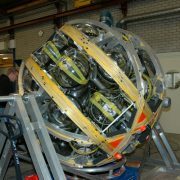 In the lab the launching vehicle the detection unit with ropes, backbone cable and 18 optical modules are coiled around the frame of the launcher. 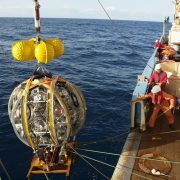 Top view of the orange buoy in the interior of the launching vehicle. Top view of the launcher vehicle. 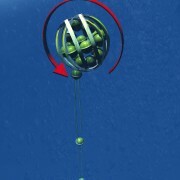 This is an early version with empty glass spheres as the top buoy. 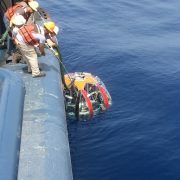 Recovery of the crown of the launching vehicle. Recovery of the empty frame of the launching vehicle. 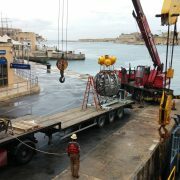 Launching vehicle in the harbour of Malta. Launching vehicle covered with plastic on board the deployment ship. 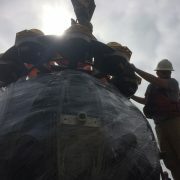 Launching vehicle covered with plastic being loaded onto the deck of the deployment ship. Inspection of the launching vehicle on board, prior to development. Launching vehicle with detection unit coiled around it waiting for the ship. Launching vehicle with full detection unit coiled around it waiting in the harbour. 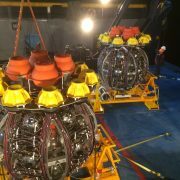 Two launching vehicles coiled with detection units on deck prior for deployment. 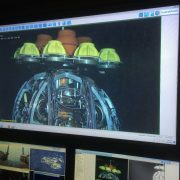 Detail of the launching vehicle with a top view of an optical module inside. Backbone cable zigzagging from one cable tray to the other. 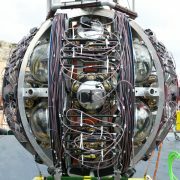 Detail of the launching vehicle with the backbone zigzagging from one cable tray to the other. Also visible the black spacers that have to keep the ropes of the detection unit parallel. 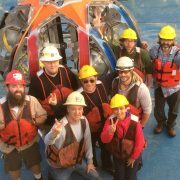 Happy crew in front of an empty frame of the launching vehicle after successful deployment of a detection unit. 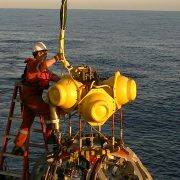 Connecting the launching vehicle to a cable for transport to the seabed. 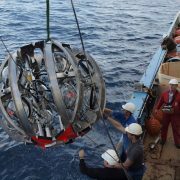 Launching vehicle at the seabed at a depth of 3500 m.
Launching vehicle at the start of deployment. Deployment of a prototype launching vehicle.